This weeks’ edition of University World News has a special on academic freedom. Most of the European coverage in this edition is based on a recent article in the journal Higher Education Policy: Academic Freedom in Europe: A Preliminary Comparative Analysis by Terence Karran. The outcomes of the article raise interesting questions. Not just on the different levels of academic freedom in different countries, but also about the nature of academic freedom and its value. On the basis of comparative data from 23 states within the European Union, the article concludes that academic freedom is highest in Finland, Slovenia, the Czech Republic, Hungary and Spain. The lowest levels of academic freedom can be found in countries such as the United Kingdom, the Netherlands, Denmark and Sweden. Not exactly what most readers would expect, I guess. So how does the author operationalise academic freedom? Basically it is measured on the basis of five dimensions: (i) Constitutional protection; (ii) Specific legislative protection; (iii)Self-governance; (iv) Appointment of rectors; (v) Academic tenure. The first two refer to the question whether freedom of speech and academic freedom are legally embedded in a nation’s constitution and other legislation. The other three refer more to the way higher education in a country is organised and governed. Let’s have a look at both the legal and governance dimensions to explain the surprising outcomes. But more interesting are the three dimensions related to governance. My bold conclusion is that Karran here confuses academic freedom with academic power. The tree dimensions used here boil down to this: collegial governance, academic appointment of leadership and unconditional tenure of academics provide a high level of academic freedom. This seems to be rather straightforward. And indeed, it is also somewhat contradictory to the reforms that have swept countries like the UK, the Netherlands and Denmark (and many throughout the rest of the world). 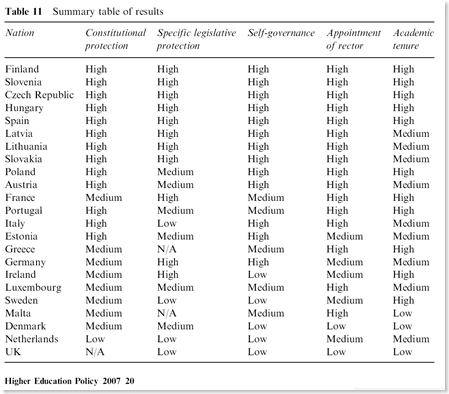 These countries have given increased autonomy to their universities, often leading to stronger institutional leadership (as opposed to collegial, academic governance). But they were given that power to respond better to social and economic problems. 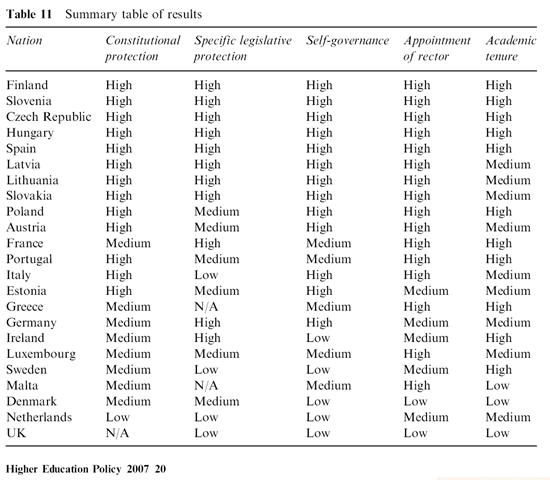 Looking at Karran’s ‘ranking’, I would guess that institutional autonomy is negatively correlated with (his interpretation of) academic freedom. So is academic freedom the same as academic power? If we answer this affirmatively (as the article does, in my opinion), my question would be: is academic freedom as valuable as it is believed to be? I think academic freedom is a valuable good. But at the same time, I don’t think academics by definition have the exclusive right to determine what issues are important enough to be taught and researched. I’m not so convinced they are all capable of that. In my view, students, governments, public agencies, industry, NGO’s and foundations might provide a useful contribution to this process. Thanks for your comments! First of all I have to agree with you that academic freedom indeed is a tricky issue. I agree that academic freedom is not identical with institutional autonomy, and also that the distinction is not always made clear. I do think that they are related. I think that in general, institutional autonomy – vis a vis the state – is a necessary condition for academic freedom. In many countries (and especially (semi-)authoritarian states), academic freedom cannot exist if universities are too much entangled with the government. Wit academic power I meant the discretionary power of academics to determine their own topics and methods and publicise their results, without interference or threat from government or other parties. I think this is a good thing in principle but that does not mean that there should be no accountability and that others outside of academia cannot criticise the choices made by academics. Academic freedom also comes with a certain responsibility for academics. I’d also be very interested in the results of your research into the more qualitative aspects and how other aspects than written rules affect academic freedom. I read your response to an article in the Times Higher Education. You made clear that the HEP article indeed was a preliminary (as the title says) analysis, only taking into account legal documents. It also says that you’re involved in an ESRC project based on a qualitative analysis of how these legal documents are interpreted within the everyday interactions of academic staff. It will be interesting to hear about that in the future. Many link institutional autonomy to academic freedom. I admit it is hard to separate. But if an institution has lots of autonomy and is run by a bunch of bastards, it could be such an unpleasant place to work–the atmosphere so harassing–that one need not concern oneself with academic freedom in the abstract. I wrote a short piece for UWN on academic freedom in Japan’s HE, but the longer piece is at my blog. The following link will take you to both a long version and a short version. The short version is similar to the one that appeared at UWN, but better. ???! ?????????? Marie Claire (HK) Edition	???????????????????????????????????????97???????18?????????????????????????????????????????????????? Kanebo ???-?? ????????38??????????? Kanebo ???-??,??????,38?????? YIN’S Blog: ???? ??2?????? ~ ??????? YIN’S Blog: ???? ??2?????? ~ ?????? ?